Leo'z Arts is available for all artistic services. We have over 15 years experience in Art Entertainment field. You can hire us to add a unique and interesting services to your residential or corporate events. 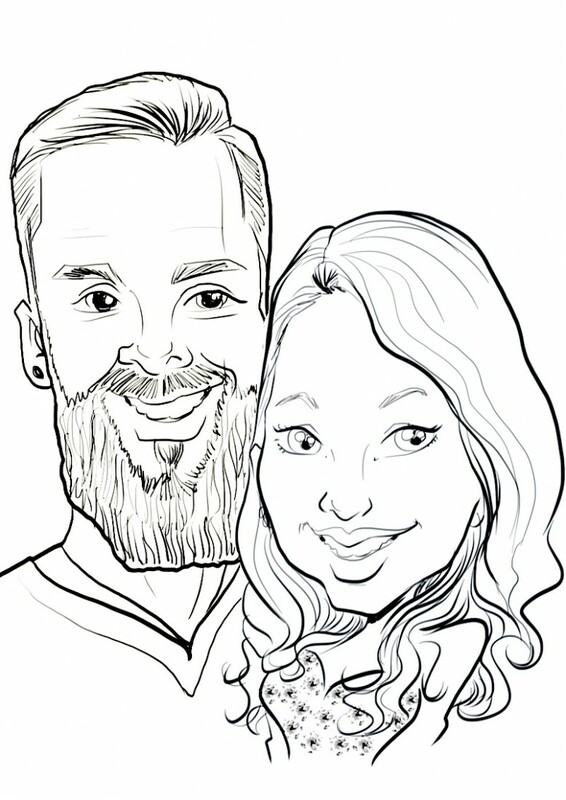 Book us for art services such as hand-drawn caricatures, digital caricatures, hand-cut silhouettes, bracelet engravings and airbrush tattoos. Package prices are available. With Leo'z Arts you can also mix and match our services to suit you. 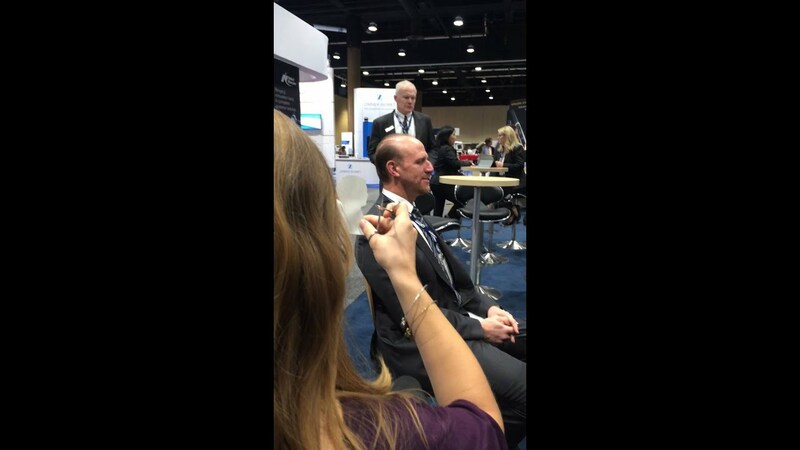 Caricatures, airbrush tattoos and silhouettes can be hired in for medium to large events. Bracelet engravings and silhouettes cutting can be hired in for more elegant events. 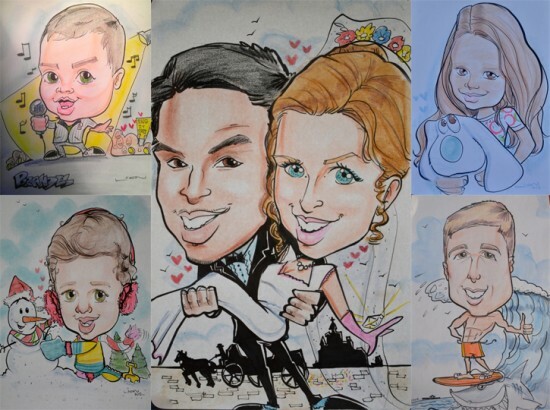 We had two artists (Leo and John caricaturists) at my sons wedding. What a hit! They created an entire new level of fun to the reception. I was a little concerned the guests might need to pose too long but was so not the case. These two gentlemen are true professionals who could draw in minutes and had amazing personalities interacting with everyone. Every single guest was showing off their drawings. What an awesome gift for each of them to always have. The pricing is extremely affordable and worth every penny. I STRONGLY suggest you look into LEO’z Arts and Photography for your next special function. They have many different options to choose from and will from this day forward be at the top of my list for all my families special celebrations. Thank you Leo and John for making my sons and his wife’s special day all that more special. We hired Leo’z Arts for our son’s 1st birthday party and it was a great success. 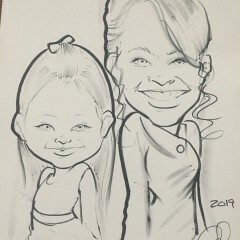 Elena did awesome caricatures. She had great details with everyone from couples to babies. It was lovely. We were concerned that she wouldn’t be able to do our son or our 10 month old nephew but she did a very nice job. Guests loved it and we have great keepsakes now. Would definitely book again. 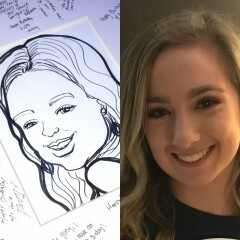 Thank you to Leo’z Art for providing such great service and making my daughters high graduation party a memorable event. Alan did a great job and the guests commented how nice he was. We counted 55 guests in total which were teens and adults and he was busy the entire time. The only thing I would have changed is booking him for more than two hours but that was what worked in my budget. I would certainly utilize Leo’z Arts again in the future. Thank you so much, Sherry! We are looking forward to working with you in the future again!!! Awesome!! There’s no other word! Excellent art and the process was fun! All our guests loved it! Thank you!! Many, many thumbs up for this booking!! Loved, loved, loved! Our artist was on time, super friendly and professional and our guests at the baby shower absolutely loved him. I would hire him again and again. We just hired and then used Leo'z Arts for a party this past weekend. We used 2 digital caricature artists and one traditional one. All were amazing! Not only was their work product amazing but they came early and even stayed late to finish up my daughter and her friend! They treated my guests with the utmost respect. This company is a model that all companies should follow in respect to every quality measurement you can think of. They even drove down from the Orlando area to our party in Deerfield Beach. No need to look further as you will not find a better company. No doubt I will use them again for future events. This was fun to have at my daughters sweet 16... and very reasonably priced. But you get what you pay for. The drawings the artist produced were very basic and lacked distinguishing features. In short, they all looked the same. Hello Heather! We are sorry that you were not fully satisfied with the drawings. Caricatures depends on many different factors, but most girls prefer not to be exaggerated and we try to keep realism. Let us know if you have any other questions or concerns. Thank you! Leo'z is an Awesome Artist!!! Leo'z Art & Photography was fantastic!! 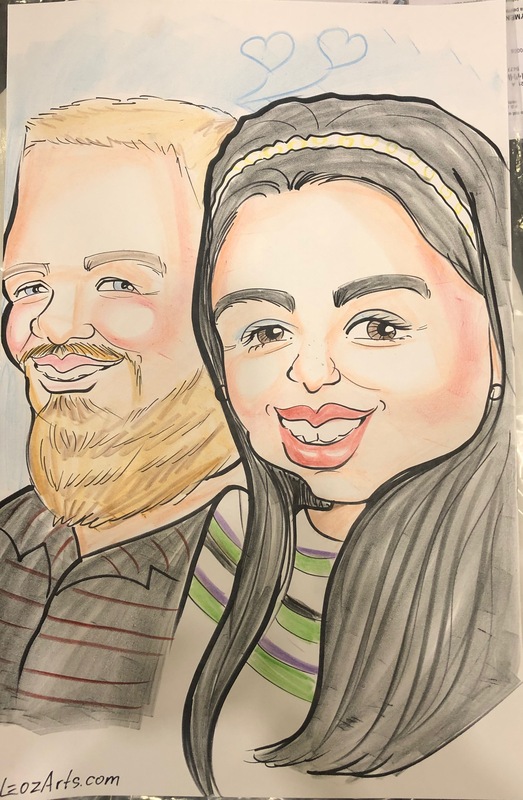 We had approximately thirty guest at our birthday event and they all were overjoyed with the results of their Caricaturist drawing!!! Thank you GidSalad for your assistance in finding a talented artist like Leo'z for us! For my daughters birthday had a face painter and a caricature artist, who was Leo. Both were professional and the kids and adults joined in on the fun. 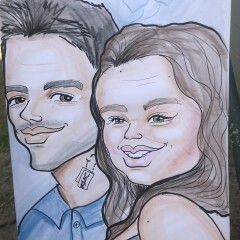 Caricatures were done very quickly so everyone was able to get one. Would highly recommend and will definitely use again in the future. Leo'z Arts was amazing. All my guest were in aww of his creativity. We highly recommend him! Thank you so so much Casey! What a great addition to our annual event. Leo and team were very professional and a pleasure to work with. 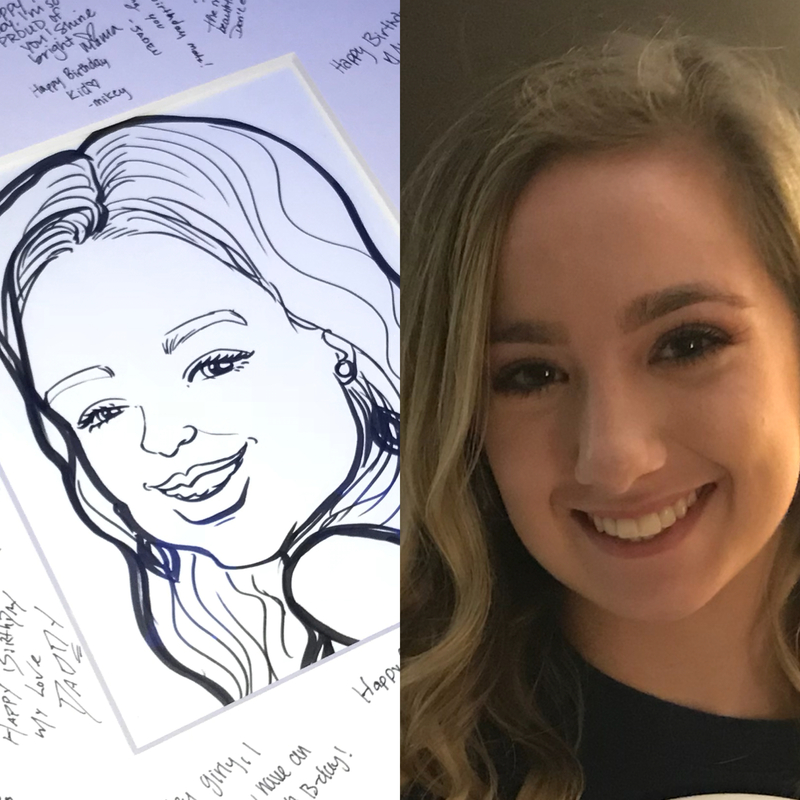 I would highly recommend Leo'z Arts for caricatures for your next event! I needed a unique service for my event and Leozarts delivered at an affordable price also. The service i booked was a bracelet engraving service and caricaturist, everyone loved it. 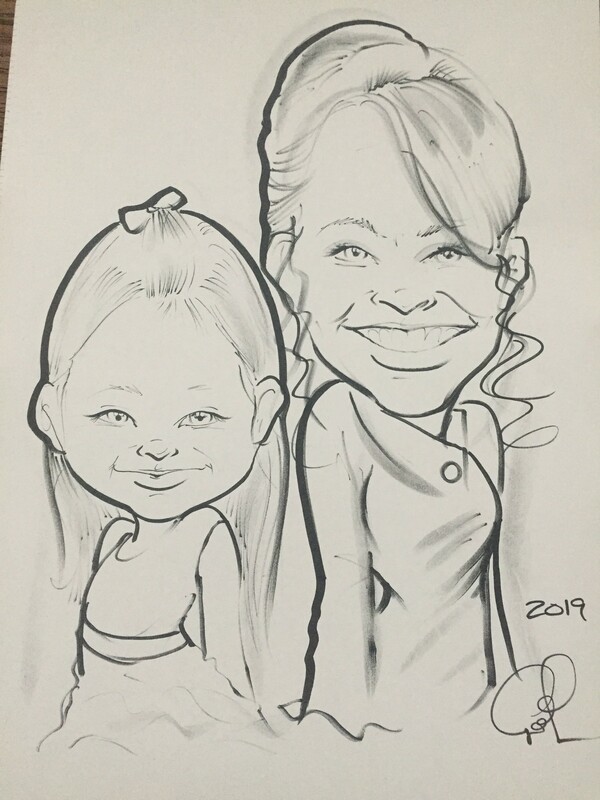 We specialize in entertainment arts services such as hand-drawn caricatures, hand-cut silhouettes and temporary airbrush tattoos which you can add to your reception. We work with only experienced artists in their chosen field. 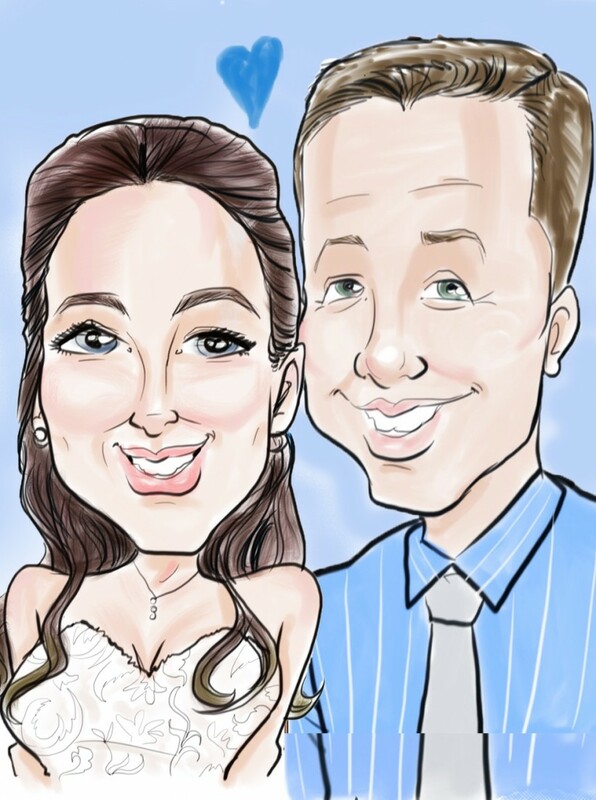 Our caricatures are funny, flattery and have the sense of personality. This art form fits any occasion and makes a great keepsake for party guests. It takes about five minutes for a black and white caricature. Our silhouette artists are few of the kind. This art form is very unique. We have done silhouettes on wedding receptions and guests were absolutely impressed by artist's skills of transforming black paper into people's profile! Bracelet Engraving will be a hit for those events like Sweet 16's and Wedding Receptions. In this service we use small dremells to engrave leather bracelets. Guest can request a name or a date on their bracelets. Temporary Airbrushed Tattoos are great for those fun birthday parties, block parties or festivals. We use tattoo stencils and quality movie effect temporary tattoo ink. Leo'z Arts is one of the only companies which has all artistic event services in one place. We have a talented and artistic team specializing from caricatures to hand cut silhouettes. So the next time you are thinking of your next event, either birthday parties or a super big event like a corporate party needing for art services in Central Florida Leo'z Arts is available for you. 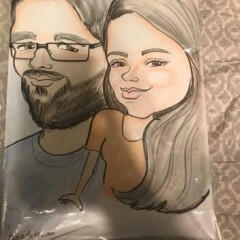 Our caricature artists in Orlando Florida have experience working in the biggest parks such as Disney, Universal Studios and Seaworld. 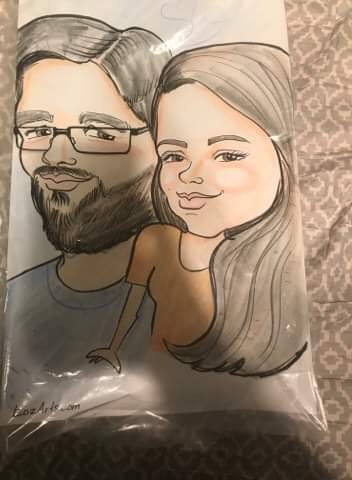 We also have hand-cut silhouette artists for events in Central Florida and further, airbrush temporary tattoo artist for events and engravable leather bracelets. Leo'z Arts is located in Orlando, Florida but we are able to travel to your destination. 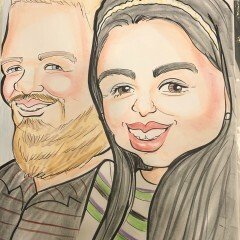 For hand drawn caricatures we use markers and color sticks which doesn't require any special equipment. If you are looking for digital caricatures in Orlando Florida or anywhere else in the state don't look any further. You will be impressed by our professional set up and high quality results. We use pressure sensitive tablets and your quests can watch the art projected on the screen. 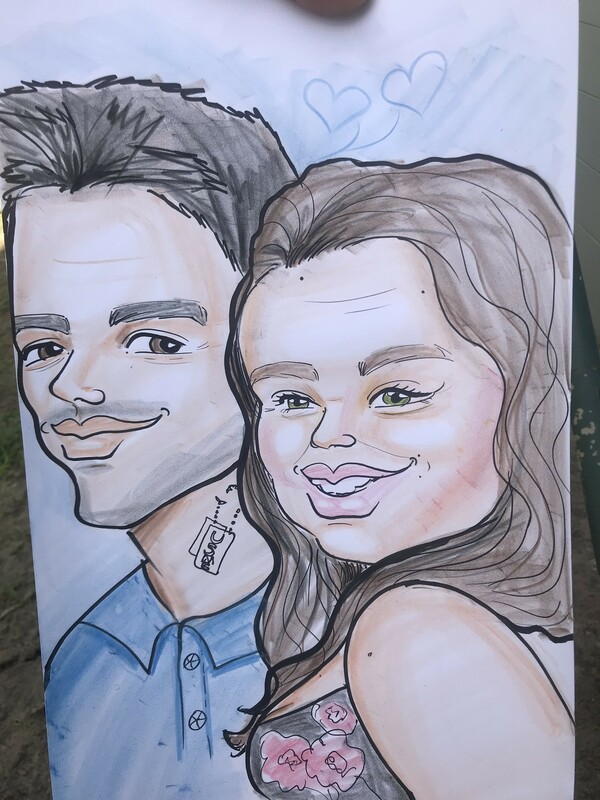 We offer printing on the spot so guests leave with there personal caricature which they can frame or keep as a souvenir. Spacing, work area and electricity for artist will be provided by you. Our space requirement is not much, but safety is the only requirement that is needed.